The return to school from Christmas break has been rough. In more ways than one. But today there was some light in an otherwise dismal week. 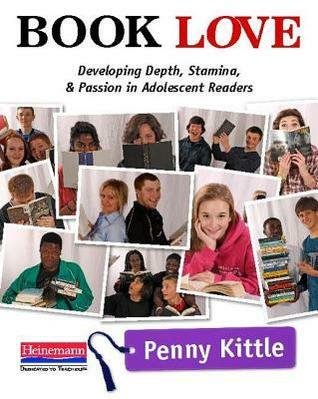 Over break I participated in a book discussion on Facebook and Twitter for Penny Kittle's newest book called Book Love. I had read the book in November and loved it, declaring it worthy of the same pedestal on which I hold The Book Whisperer. It was through the book discussion I realized that upon the first week back from break, I would make sure that students would be figuring out their reading rate. Then multiplying that number by two to figure out how many pages they should be reading weekly on their own. Having students complete this exercise yesterday was eye opening. I had students reading anywhere from 4 pages to 28 pages in ten minutes! How can you hold both of those students to the same reading standard? You can't. But the eye opening part really came today when I started conferring with them about their numbers. A lot of students talked about how they interpreted their numbers and many of them said that their numbers depended on what kind of book they were reading. I heard a lot of discussions that began much like this: "Well, I was reading a really good book so of course my numbers were higher. If I was reading a boring book this number would be much lower." This was not from my prompting whatsoever. I just asked them what they thought of their numbers. The other conversation I had with a student is one I've had many times: the absolute necessity for teachers to have extensive classroom libraries. When I was talking to a student today about her reading rate, she explained to me that she was really happy with her numbers and she knows that they would have been lower last year because last year she didn't like reading and now she does. When I asked her what made the difference she said, "This year I have way more books to choose from than I did in years past. Plus, doing so much reading made me realize what genres I like best." Talking to these students and hearing from their own mouths what they think of their numbers made me realize even more what a travesty it is that our educational system relies so heavily on test scores. Here I have a group of students who calculated some data and were able to interpret what those numbers mean for THEMSELVES. They knew that those numbers are not static and can fluctuate from day to day and book to book. But politicians and educational reformers look at numbers and only see black and white, success or failure. If I learned one thing today it is that we need to be listening to what our students are telling us about their numbers, not asking the numbers to tell us about our students. I agree one of the reasons I home school I have one child that excels in math and one that stays on somethings a little longer. Same with other things read, latin study, and science so I agree. I try and make learning fun too what happened to all the fun stuff. As a mother/college grad and nursing background I love making things fun. I was not homeschooled and I remember having some fun teachers who really loved teaching. Having a teacher that loves to teach is key!!! I agree with tests but not as many as they have. I also think that basing all education here in the state I live Utah is sad. Great Post!!! What fascinating insights! Since I want to be a teacher, this post was totally interesting. I'll have to check the two books you mentioned. I have taught for awhile now and am always looking for other ways to get students inspired to read. I really liked the connection the student made for you between seeing how their own numbers fluctuated based upon their interest level of the material. Sometimes it just takes students getting hooked on that one book to make all the difference. Your students are lucky to have you as a teacher who will show them this useful skill.